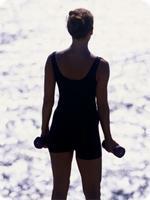 Knowing your fitness level is a good thing whether you are a couch potato or a fitness freak. If you are one of those people for whom fitness really matters and you have an exercise routine that keeps you in shape, then getting to know your fitness level can be a an exercise that will help you set targets for the future and help you get fitter. The fitness tests given here will let you know how fit you actually are. This VO2 Max test calculates the amount of oxygen that your body uses at the peak of exercise and is a world renowned fitness tests used by gym instructors, trainers and sportspeople for fitness testing. The test here is based on the tried and tested Cooper 12 minute run test. To take this fitness test, stretch and warm up properly for at least 10 to 15 minutes. The best place to do this test is on a treadmill or a measured track. Once warmed up, walk or run for 12 minutes at a stretch maintaining as constant a pace as you can. After 12 minutes, note your distance in meters. Multiply this figure by 0.0225 and then subtract11.3. This will give your VO2 Max rate in ml/kg per minute. Your fitness level based on your VO2 Max rate can be checked through VO2 max tables that are easily available online. As a general indicator, you can also use the tables given below. E.g. If you are a male aged 26-35, and your VO2Max is 30-34, then your fitness level is Poor. The push up test has been used since centuries among men to test fitness and strength, and you can rest assured that this is one certain way of testing your overall fitness level. To take this test, all you have to do is count the number of push ups that you can do at a time. It is ok if you are doing kneeling push ups too, but only if you are a beginner. If you are used to full body push ups, then you can use this test as a fitness gauge that can easily tell the men from the boys. You can use the push up fitness test to monitor your fitness level while you are on an exercise program or to compare your performance with others in your exercise or workout group. Please keep in mind that this test is for people below 45 years of age. Test your results based on the following information, with the numerals showing the number of pushups that you can do in one go.